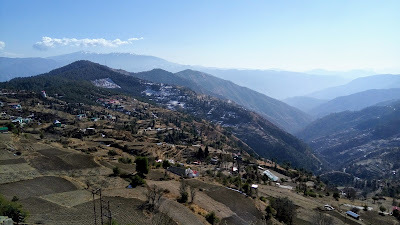 In this post, I am only going to mention Kufri since including Chail will make this post long & boring. 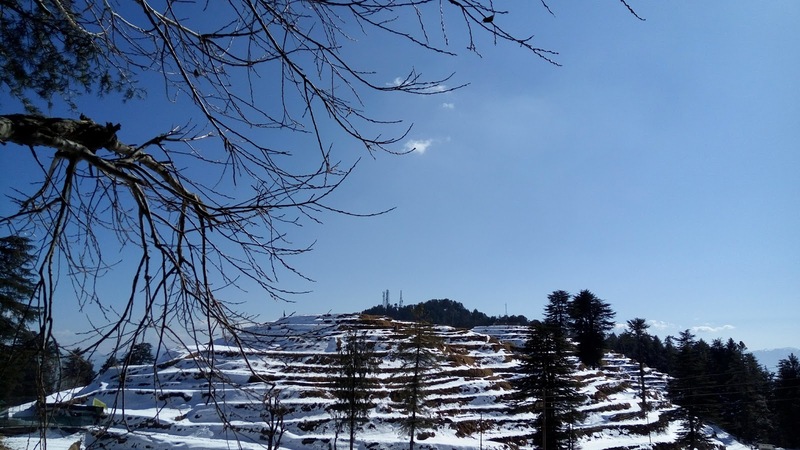 Kufri is a small hill-station situated around 20 KMs from Shimla. This place is famous for its scenic beauty (more so when it snows) & adventure activities like Skiing. On the way from Shimla (National Highway 22), you will see an area full of Deodar & Apple trees with beautiful view of mountains in back-ground called Green Valley. Below is a photo I clicked when we asked our driver to stop on the Highway. You can see Apple trees in the foreground. Green valley & Apple trees. Another one showing the tall Deodar trees. Green valley & Deodar trees. 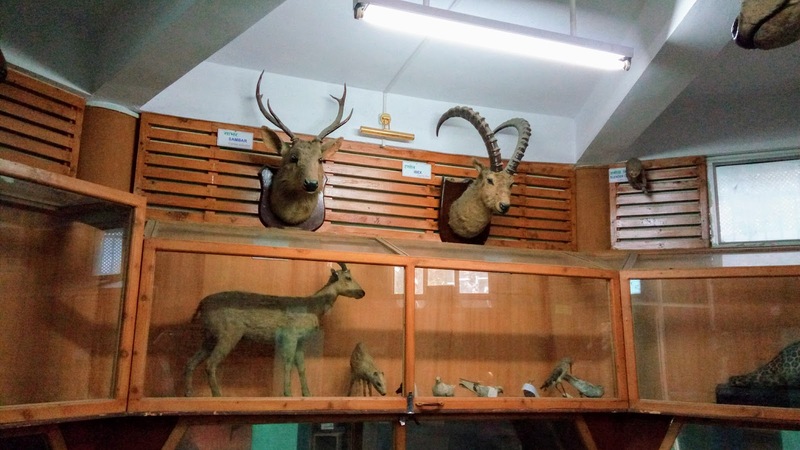 Then, there is Himalayan wild life zoo where you can find rare antelopes, felines & other birds including Himalayan monal which is state bird of HP. From its entrance, it leads to a small museum which exhibits stuffed animals. Nothing much to offer but if you have kids in your group, they will enjoy it for sure. Just like my niece did :-) After you are done seeing it, you will find the stairs there which take you to the zoo. We didn't go to the zoo even after buying tickets. It had snowed heavily & the area was quite slippery. Entrance ticket is 30 Rupees per adult. There were a lot of monkeys as well, so we didn't take any risk especially when the roads were slippery. Below is the photo I took from inside the zoo. If you're more into natural scenery & want to see how they do farming there, keep your eyes open while you are en-route to Kufri. You will see something like below. You will see how localites have converted the hills into steps for their farming. If you don't mind riding horses or mules & have no fear of monkeys, Kufri has a lot to offer. Scenic beauty, cold weather, natural scenery, adventure & fun. 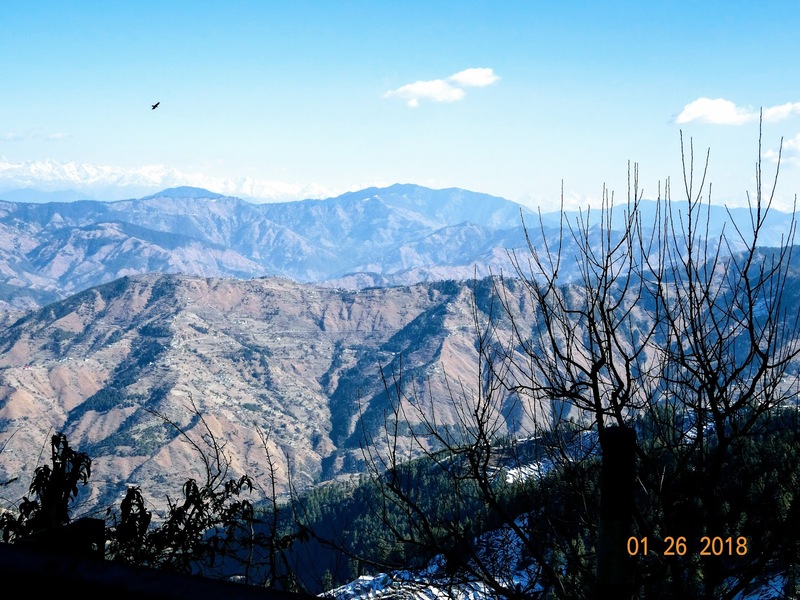 If you want to explore the rural side, Kufri won't disappoint you. However, I don't see people coming here if there is no snow. Plenty of sunshine might disappoint you if you don't like it in abundance :-) But yes, scenic beauty of Green Valley will excite anyone, despite the weather (or lack of snow). You can book a cab directly there in Shimla or you can have it included in your tour package. Note that during heavy snowfall, the roads are very dangerous & chances are that you will find chaotic traffic jam. 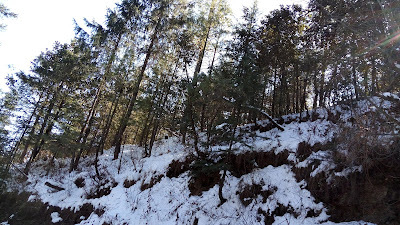 Its a steep mountain slope and cab drivers may refuse to go if there is heavy snow.